Complaints about Starbucks’s new holiday cup pushing a “gay agenda” turned out to be a tempest in a coffee mug. Initially, Starbucks’s consumer perception trended in a positive direction following the cup’s November 1 introduction – its most consistent cup debut run in three years, according to YouGov BrandIndex. A video to promote the launch of the holiday cups showed a pair of cartoon women holding hands, and the edge of the cup itself featured another pair of seemingly androgynous clasped hands, which won praise from many LGBT organizations. However, the two-week run subsided after BuzzFeed published a story on November 15 about the attention the cup was getting from the LGBT community. Starbucks itself would not confirm or deny the gender of the hands to BuzzFeed. The article seemingly prompted Fox News to publish its own story, quoting religious critics of the cup’s design, while conservative site The Blaze touted Starbucks’s "gay agenda campaign." The hubbub ended Starbucks’s positive perception run, and it has since settled back in at its normal level. Two years ago, the Starbucks holiday cup was a solid red without any of the traditional seasonal symbols and characters, prompting a very significant consumer perception drop for the brand, lasting more than three weeks. 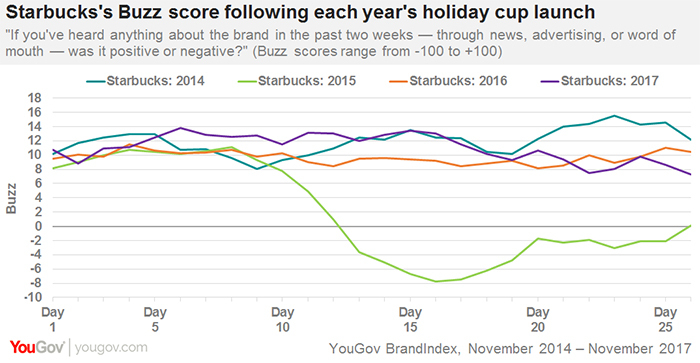 Starbucks was measured with YouGov BrandIndex’s Buzz score, which asks respondents "If you've heard anything about the brand in the last two weeks, through advertising, news, or word of mouth, was it positive or negative?"